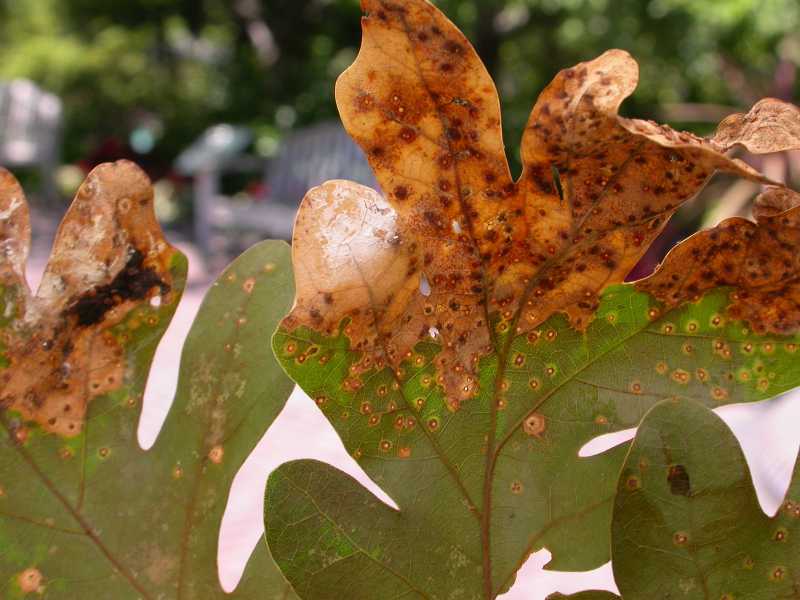 There are several possible reasons for oak leaves to turn brown in late spring. One of the most interesting is the jumping oak gall (Neuroterus sp.). These galls, which are caused by a small stingless wasp, fall to the ground and jump much like a Mexican jumping bean. Damage may be severe for one or two years and then the population declines as natural controls become effective. White oaks and other oaks in the white oak group are the host species. Although infected trees may be defoliated, the problem is rarely fatal for healthy trees. 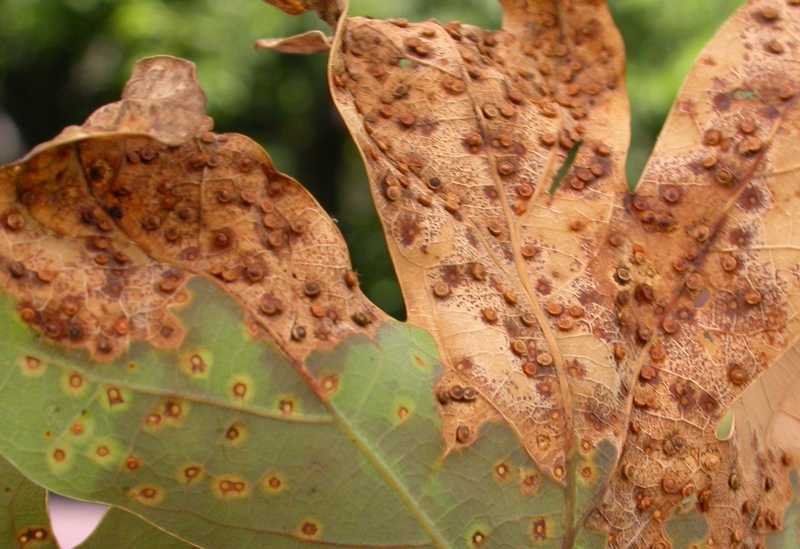 The first symptom of a jumping oak gall infestation is brown leaves on oak trees in late spring. Severe infections may cause the leaves to turn black, curl up and fall to the ground. If the population of the insects is high, the entire crown of large groups of trees may be affected. 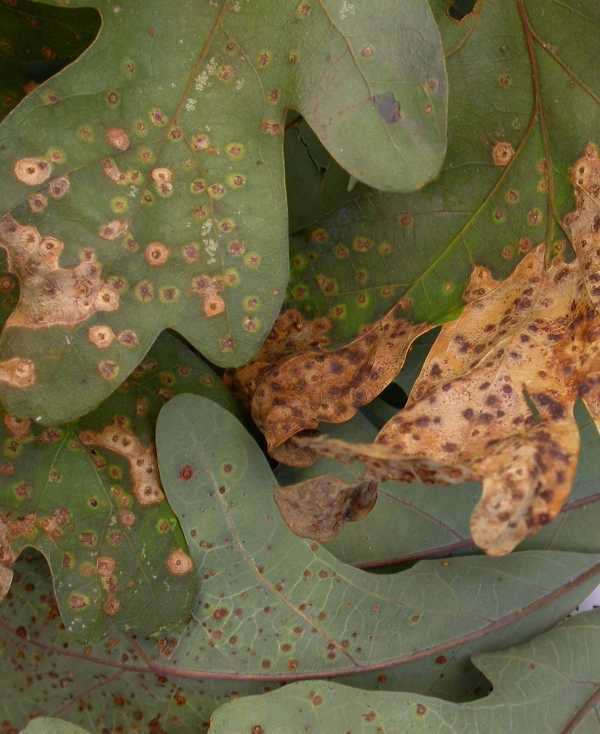 Close inspection of affected leaves reveals 1/16-1/8” diameter brown spots with a yellow halo on the upper surface. 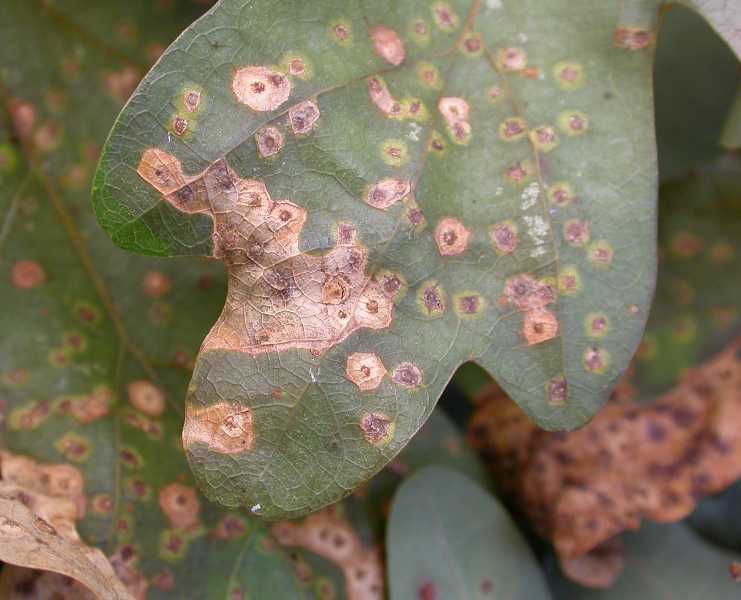 On the lower surface, there are brown galls, a malformation of the leaf’s growth that has been caused by the larva of a small wasp living inside the gall. In early summer, when the larva is mature, the gall falls off the leaf leaving a brown pockmark. On the ground, the fallen galls may jump a few centimeters due to the movement of the larva inside the gall. This jumping helps the gall to move into leaf litter or cracks in the soil where the larva will overwinter. In early spring, the female wasp lays eggs in developing leaf buds. The egg hatches into a larva that will live in and feed on the gall tissue. In early summer, the gall drops from the leaf and moves into leaf litter or the soil. The larva will mature into a pupa and overwinter in the gall. In early spring, the female wasp chews its way out of the gall and completes the life cycle. There may be up to two generations a year but any significant outbreak seems to be limited to just one of the generations. 1. Keep trees healthy by mulching, watering during dry periods, avoiding injury from lawnmowers and trimmers, and fertilizing in the spring. 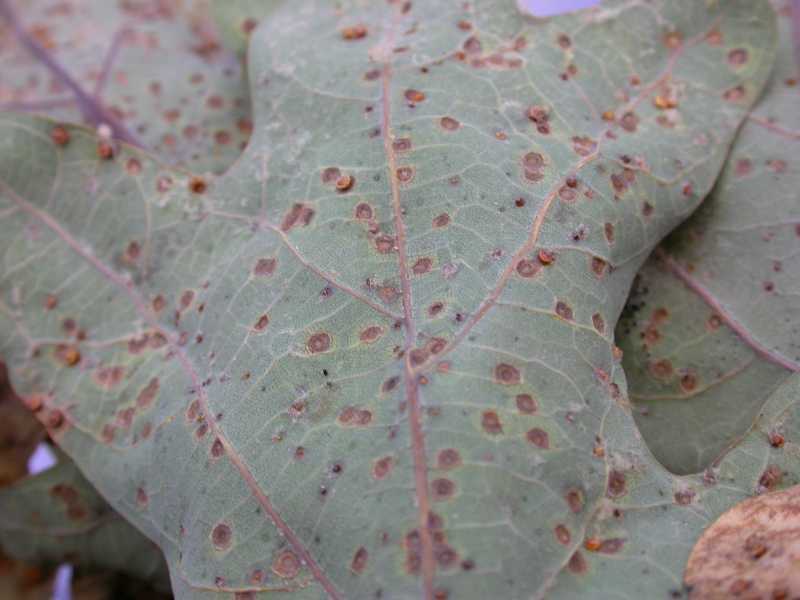 Unless a tree is already stressed due to disease or drought, jumping oak galls usually do not affect tree health and by the time the damage is noticed, it is too late to begin treatment. Insecticidal sprays are not recommended. 2. Practice good garden sanitation and dispose of fallen leaves to remove sources of disease or pests. Strategy 2 is a strictly organic approach. Strategy 1 could be considered an organic approach if an organic tree fertilizer is used.